Once cut, a pumpkin lasts about four to five days, then starts to rot. You can rub Vaseline on the cut parts to help with deterioration. Think about cutting out the bottom of the pumpkin instead of around the stem - place your candle on the porch or walkway then place the pumpkin on top. This will prevent the cut out stem section from falling in when rotted. 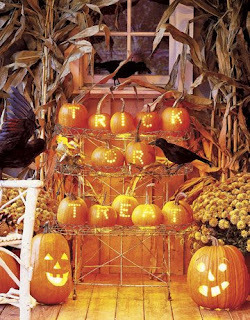 Pumpkins are a great way to show some creativity - will you make a scary face, write your initials, a jack o lanturn or maybe turn it on its side and make a candy container?